Sometime I feel like we live in the 19th century at Lida Farm. Last summer we milked a cow by hand. We harvest a lot of produce with big harvest knives. And I feel like we’re always out digging with shovels more often than we should to for some reason. I call it modern-day peasant culture; some may like to market it as ‘artisan’ while others label our lifestyle just a waste of time. 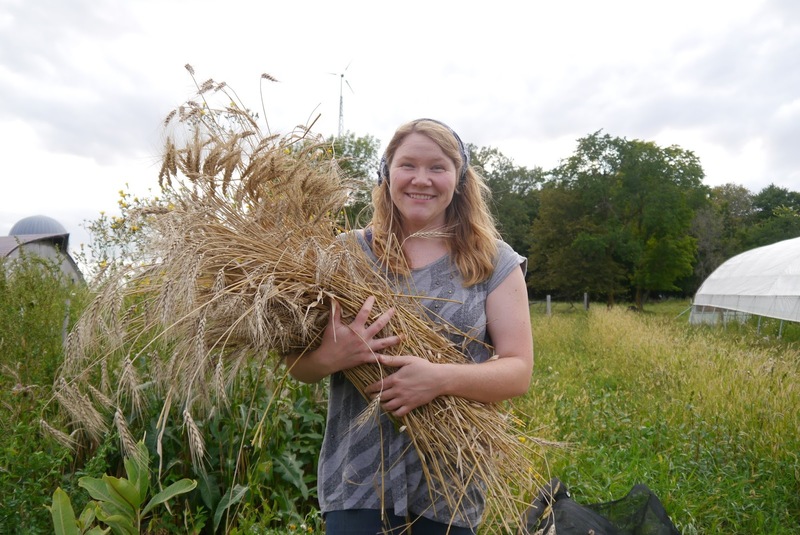 Either way, I really felt like a medieval serf this week when we harvested our little patch of wheat by hand. To use a combine on a piece of ground 6 feet wide and 40 feet long would be ridiculous and it was too weedy anyway. 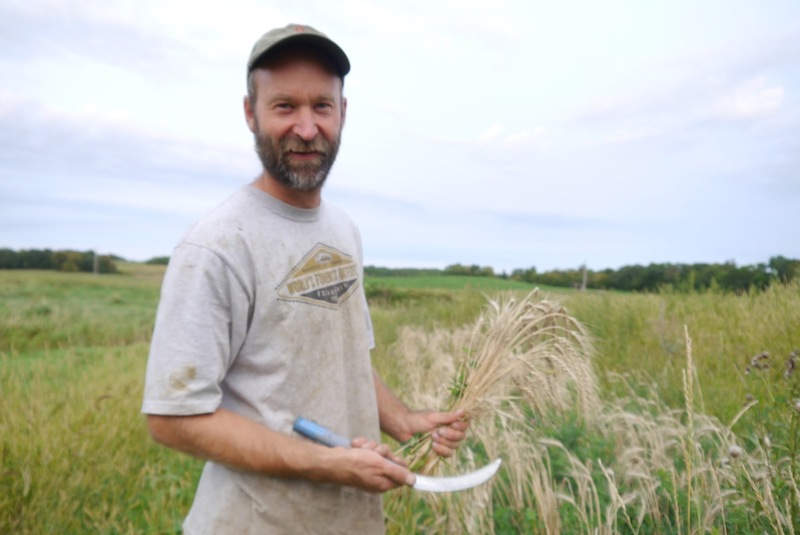 I used our salad mix knife to cut the wheat and we threw it on a big tarp. Once it dries a bit more, we’ll beat the stuff with a plastic baseball bat and begin to separate the wheat from the chaff in a high wind. Lord knows if this will be worth the time, but it’s been a cool process. Leek or Cippolini Onion: Most received a leek like last week, but I ran a bit short and a few received a Cippolini, a flat onion, which is my favorite and very flavorful. Red slicing tomatoes: Most of these are a Celebrity or Defiant varieties, which have been been performing great this year in the field. Yellow ‘Golden Rave’ Romas: These are best eaten fresh, instead of cooked as most romas. Italia Pepper: Red and green like the Italian flag, this is a very sweet pepper, good for sauteing or eating fresh. I love the world of sustainable agriculture. It attracts a great cast of actors few other fields can claim. Organic agriculture attracts serious foodies, left-wingers in search of utopia, Christian home-schoolers, reformed hippies, would-be hippies, people who like to wear plaid, feminist crusaders, and, well, people who just like to eat tomatoes that taste better than cardboard. It’s a wild mix of passionate people who feel that agriculture holds a key to unlock many of the challenges which currently challenge us, including community dissolution, climate change, and healthcare to name a few. I believe organic ag holds an important place to improve our world as well, otherwise I wouldn’t be spending long hours in a the blazing heat to make this work. A great example of this attraction came last week when my friend Zach and I were getting ready to harvest our garlic crop on Sunday. It was a nice surprise when I found that a few folks who were traveling cross country caught up with Zach and decided to lend a hand for the day. I doubt the same crew would have helped on a plumbing job or cashiering at the local big box. 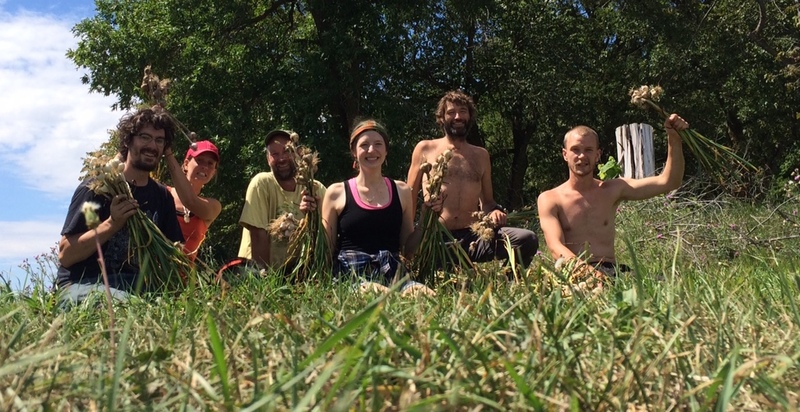 Instead of just three of us digging up garlic by hand we had six, which makes a huge difference when pulling in over 1,000 heads. Sun Jewel Melon: Yellow oblong things with white stripes. This is a Korean white-fleshed melon. It’s ripe, but is made to be eaten when firm. 1-2 Heirloom Tomatoes: Some got a variety called German Pink (huge tomaotes) while others got Cherokee Purple variety (dark purple and green in color). These are not for cooking, but best eaten fresh. Biscayne Pepper: A light green and long pepper. This is a sweet pepper. Merino Garlic: This is still officially fresh garlic since it hasn’t cured. You may find it a bit stronger than garlic which is completely dried down. Although this has been a long-time American tradition, the corn business is changing a bit now that GMO sweet corn is becoming more popular because it’s easier to grow. At this time, most sweet corn is still non-GMO (http://www.nongmoproject.org/learn-more/sweetcorn/) as people plant tried-and-true varieties. At Lida Farm, as certified organic growers, we are 100% non-GMO and pesticide free (all certified organic is non-GMO since GMOs are not allowed at all under organic standards). If you’re getting a hankering for more sweet corn, we’ve started to put a few dozen at a time on the farm stand (open 24/7 til October). Soak the diced onion in cold water, 10 minutes. Whisk the vinegar, sugar and 1/2 teaspoon salt in a large bowl, then whisk in the olive oil. Drain the onion and pat dry, then add to the dressing. Stir in the white beans. Bring a saucepan of salted water to a boil. Add the green and/or wax beans and cook until crisp-tender, 4 to 5 minutes. Drain the beans, then plunge into a bowl of ice water to stop the cooking. Drain again, pat dry and add to the salad. Marinate at room temperature, tossing occasionally, about 1 hour. 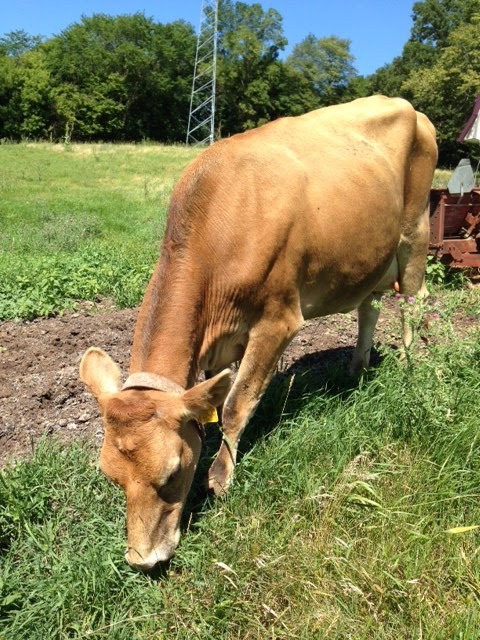 This week we took possession of a beautiful Jersey cow we named Beatrice. Our cow from last year, Peanut, just couldn’t get pregnant, so we had to make the decision to bring her to the butcher. It’s been quite a while now since we dried up Peanut and stopped milking, so it’s been a chore getting back into swing of things. At this point we’re milking two times a day with portable milking machine I picked up a few days ago; it’s almost a necessity since she’s giving five gallons of milk a day! With all the other stress we have going on with the other many moving parts of the farm, one would rightfully ask, “Why are you milking a cow? Don’t you already have enough to do?” Well, yes, we certainly do have enough to do already, but a milk cow is a real cornerstone for a small farm like ours. The operative word is “complementary”…the cow complements the other activities on the farm and the other enterprises we operate. Manure: We manured our entire 2 acres where we grew produce last fall and winter with manure from Peanut. We didn’t have to haul it down a highway or pay anybody for the material or service. Last year’s back field was a disaster, really lacking fertility and tilth. What cured it? You guessed it…manure. Animal feed: Other animals like milk just as much as humans. Whether milk that went bad or whey from making cheese, any excess we can’t use goes to our layers, broilers, dog, and pigs, especially the pigs…they will kill for milk. This cuts down feed bills and makes for a healthier animal. This doesn’t even count the calf we’ll raise with the cow. Last year’s calf brought in some much needed money in the middle of the winter after going to auction. Any dairy product you can imagine: We drink milk, make cheese, half and half, whipping cream, cream cheese, sour cream, butter milk, kefir, butter…need I go on? Beauty: I always say, we only do pretty produce, but, really, we aspire to make as beautiful a place as possible. There’s nothing more beautiful than a Jersey grazing on a dewey early-morning pasture or head down at sunset. Ah…that’s why we do this. Celery: This is the best celery I’ve ever grown. MN celery typically gets tough and stringy, but this isn’t that way…the ribs are big and full of flavor (sorry, California, your celery tastes like water).